Background Paediatric arterial ischaemic stroke is an important cause of morbidity and mortality among children. Currently, there are no recommendations regarding mechanical thrombectomy in children despite overwhelming evidence of improved outcomes in adults. Therefore, the need for individual case reports and case series is important to highlight potential advantages and disadvantages in this approach. Case descriptions We retrospectively searched our prospectively maintained database of patients undergoing mechanical thrombectomy for ischaemic stroke. We describe five children, aged between 7 and 17, who underwent mechanical thrombectomy for acute ischaemic stroke. We provide an account of their clinical presentations, operative treatment and postoperative outcome. Discussion Mechanical thrombectomy in children, especially older children, can be performed safely and with existing devices. Although a randomised controlled trial would provide compelling evidence of the potential advantages to this technique, the lack of this should not prevent the use of this procedure by trained neurointerventionists. Paediatric stroke is one of the most common causes of death in children. The incidence of childhood stroke that ranges from 1.3 to 13 per 100 0001 with a mortality of approximately 3%–6% and with up to 70% of survivors debilitated with significant deficits.2–5 Approximately 50% of paediatric strokes are ischaemic in nature compared with 87% in adults.2 6 The underlying causes for acute ischaemic stroke (AIS) in the paediatric population are variable and naturally different from those seen in adults. It is increasingly recognised that infection, arteriopathy, trauma and cardiac conditions play an important role in paediatric AIS7–9 with arteriopathy emerging as a leading pathogenesis.10 11 Atherosclerosis is infrequently seen and in approximately 10% of cases no cause is found with a previously healthy child reported in approximately 50% of cases.3 10 Interestingly, recurrent stroke is also relatively common in the paediatric population with rates of up to 35%2 12 13 and recurrence being particularly common in children with arteriopathy. Recent successful thrombectomy results in adults have transformed the management of this condition and it is hoped a similar replication of these results will be seen in the paediatric population although this age group represents its own challenges, especially in younger children. In class IIb recommendations on endovascular treatment of paediatric AIS by Ellis et al,14 mechanical thrombectomy alone or in combination with intravenous tissue plasminogen activator (tPA) is suggested over solitary thrombolysis because of the reduced haemorrhage rate. Here we present our series of five patients, all treated with mechanical thrombectomy. We detail the clinical symptoms, imaging findings, operative technique and outcome. Five children were identified (3 female, 60%) with average age 13.2±4.1 (range 7–17 years). In four cases, the anterior circulation was affected and in one case the posterior circulation was involved. The average National Institutes of Health Stroke Scale (NIHSS) was 11.2±8.2 (range 2–23). The majority of the children were imaged with MRI (4/5, 80%) and the average Alberta Stroke Program Early CT Score (ASPECTS) for the patients with anterior circulation occlusion was 7.75 (range 7–9). All of the occlusions were left sided. The clinical and imaging details are summarised in table 1. A variety of operative techniques were used but in general we do not use balloon guide catheters and favour a combination of both stent retriever and local manual aspiration with a distal access catheter. The equipment used in each case is summarised in table 2. A late teenage patient presented to her local hospital with an acute right hemiparesis, a spatial neglect and global aphasia (NIHSS 9). An unenhanced CT scan of the head was performed and this showed a hyperdense middle cerebral artery (MCA) sign. The patient was treated with intravenous thrombolysis (83 mg Actilyse intravenous). After an initial clinical improvement the patient deteriorated further. 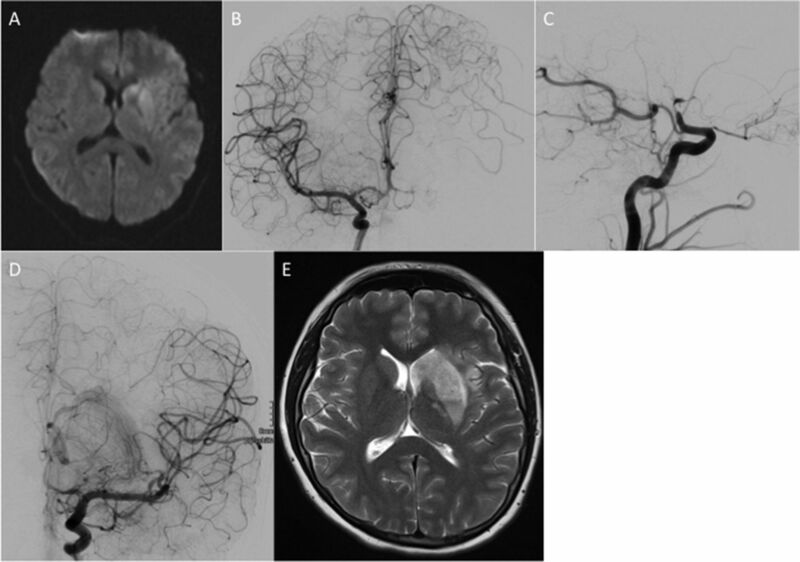 Therefore, 90 min after admission an MRI with a time-of-flight MR angiogram (TOF-MRA) was performed which showed a persistent left carotid T-occlusion, restricted diffusion in the left basal ganglia and MCA territory on the diffusion-weighted imaging (DWI) sequence, but normal signal intensity on the T2-weighted sequences. The patient was transferred to our hospital for endovascular treatment. On admission to our hospital, the NIHSS was 12. A catheter angiogram showed a left carotid T-occlusion with good collaterals from the left anterior cerebral artery and posterior cerebral artery. Mechanical thrombectomy was performed using pREset and pREset Lite stent retrievers (phenox, Bochum, Germany). After a single pass, we achieved a thrombolysis in cerebral infarction (TICI) IIb angiographic result and finished the procedure. There were no procedural complications. Only an M3 opercular branch of the MCA remained occluded at the end of the procedure (figure 1). 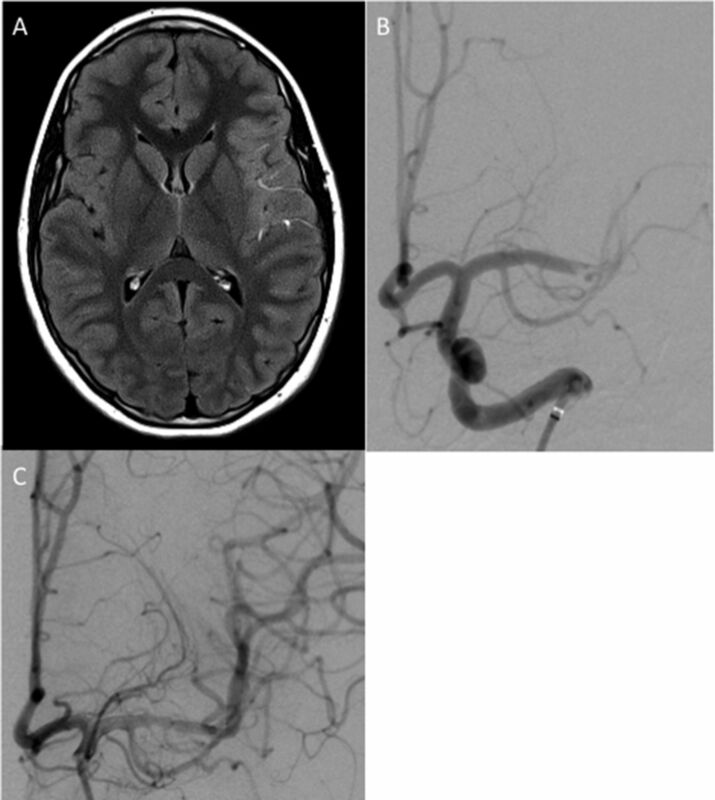 An area of restricted diffusion was seen in the basal ganglia on the left (A) with confirmation of the suspected carotid T-occlusion seen on catheter angiography (B, C). After a single pass with a pREset 4×20 mm stent retriever there was complete recanalisation of the left M1 with only a single opercular branch still occluded (thrombolysis in cerebral infarction (TICI) 2b) (D). The procedure was terminated at this point. An MRI scan performed at 24 hours (E) showed an infarction within the left basal ganglia. An MRI scan performed on the next day showed an infarction of the left basal ganglia. The patient was extubated and on day 2 transferred from the intensive care unit to the stroke unit. At discharge, the NIHSS was 3 and the modified Rankin Scale (mRS) 2 with a remaining mild hemiparesis of the right side. A reduced activity of Protein S was the only abnormality detected after full cardiac and haematological assessment. A preteen patient presented to the local children’s hospital with an acute right-sided facial palsy and motor dysphasia of 3 hours’ duration (NIHSS 2, mRS 3). An MRI with TOF-MRA was performed which showed an occlusion of the M1 segment of the left MCA and restricted diffusion in the left insular cortex. The patient was immediately transferred to the angiography suite and a mechanical thrombectomy was performed using a Prowler Select Plus microcatheter (Codman Neurovascular, Raynham, Massachusetts) and a Solitaire 3×30 mm stent retriever (Medtronic, Massachusetts, USA). After two thrombectomy attempts the clot was completely removed and the blood flow in the M1 segment of the MCA completely restored (TICI III). No procedural complications were observed. Anticoagulation with low molecular weight heparin subcutaneously was commenced. An MRI on day 10 showed a small infarction in the insular cortex. The patient returned to baseline neurology and was discharged with final NIHSS 0 and mRS 0. Antiplatelet was administered with aspirin for the period of 1 year. A late teenage patient presented to his local hospital with an acute right hemiparesis, aphasia and a loss of consciousness. The exact time of onset of symptoms was unknown but thought to be approximately 9 hours. An emergency CT angiogram demonstrated occlusion of the left M1 segment but there was no established infarction. The patient was transferred to our hospital for endovascular treatment and on admission to our unit with an NIHSS of 15. After an MRI, the patient was transferred immediately to the angiography suite (figure 2). An MRI demonstrated hyperintense signal within the M2 and M3 branches of the left middle cerebral artery (MCA) consistent with slow flow (A). Angiography demonstrated an acute occlusion of the left terminal M1 segment (B). After an initial aspiration thrombectomy attempt the M1 segment was recanalised, however, further thrombus was seen in the M2 branches and therefore further stent retriever mechanical thrombectomy was performed using a Solitaire 4×20 mm resulting in thrombolysis in cerebral infarction (TICI) 2b recanalisation (C). The initial thrombectomy attempt was performed using aspiration with a 5Fr ReFlex catheter (Covidien, Irvine, California). This resulted in successful recanalisation of the M1 segment but persistent occlusion of two M2 branches (the angular artery and a temporal branch of the MCA). A mechanical thrombectomy with a Solitaire 3×30 mm stent retriever was performed resulting in a TICI IIb final angiographic result. A CT scan performed on the next day showed an infarction in the frontal lobe with asymptomatic petechial haemorrhage (HI I) in the left basal ganglia. On follow-up MRIs performed on days 3 and 5, the left internal carotid artery (ICA) had a high-grade stenosis that was thought to be due to either vasospasm or dissection. Therefore, a further angiography was performed, which confirmed a stenosis of the left paraclinoidal ICA. After treatment with intra-arterial milrinone there was dilatation of the stenosis, suggesting that vasospasm was the underlying cause for the appearance. Anticoagulation was commenced with oral aspirin. After 20 days, a repeat control digital subtraction angiography showed ‘string of pearls’ like changes in the distal left ICA compatible with changes suggestive of an underlying vasculitis. The patient recovered well with an mRS of 2 and NIHSS of 2 at discharge. Only a mild aphasia and impairment of the fine motor skills of the right hand remained at discharge. A preteenage patient presented at the local children’s hospital with acute dizziness, headache, impairment of eye movement and ataxia (NIHSS 7). One week before, he underwent a stent-percutaneous transluminal angioplasty due to an aortic isthmus stenosis. An MRI with TOF-MRA was performed, which showed microembolic ischaemia in the left cerebellum and medulla oblongata on the left side due to an occlusion of the V4 segment of the left vertebral artery. The patient was transferred to our hospital for endovascular treatment. A mechanical thrombectomy was performed, however recanalisation could not be achieved. As the patient was symptomatic for more than 6 hours and the first mechanical thrombectomy was difficult to perform, it was decided to stop the intervention at this point due to the relatively high risk of further treatment. A CT scan was done on the next day, which showed no infarct extension. The patient remained clinically stable. After 6 days, the patient suffered from several episodes of vomiting, nausea and headache. An MRI performed at this time was unchanged in appearance in comparison to the previous imaging. On day 11, after the endovascular procedure the patient developed a new left-sided facial nerve paralysis and double vision. A repeat MRI scan was performed which showed persistent occlusion of the left vertebral artery, and given the symptomatic deterioration a repeat attempt for endovascular treatment was considered appropriate. The angiogram showed a floating thrombus in the V4 segment. A mechanical thrombectomy using an Alligator device (Medtronic) was performed and the thrombus was completely extracted with TICI III final angiographic result. The clinical course until discharge was favourable with regression of the symptoms. Only a mild ataxia and a mild facial nerve paralysis remained. A mid-teen patient presented to her local hospital with fluctuating symptoms that included right hemiparesis, facial paresis, expressive dysphasia and motor aphasia, and altered level of consciousness (maximum NIHSS 23). After initial assessment, she was immediately transferred to our neuropaediatric department for further assessment and management. On arrival to our institution, an emergency MRI was performed that demonstrated a left carotid T-occlusion with restricted diffusion in the caudate nucleus and putamen (ASPECTS score 8). She underwent mechanical thrombectomy under general anaesthesia using aspiration only that resulted in TICI III reperfusion status after the first mechanical thrombectomy attempt. Subsequent investigations revealed a patent foramen ovale that was believed to be the cause of the thromboembolism. The patient recovered well with final mRS of 0. The clinical outcome following paediatric stroke is poor, with approximately 15%–20% of those with AIS developing epilepsy, with a recent Swiss study showing that almost half of children and young adults with AIS develop long-term neurological impairments. In particular, behavioural problems occur more frequently in children than adults following AIS.12 Motor dysfunction is also common with hemiplegia seen in up to 75% of children,2 while speech and language impairments are seen in approximately one-third of children at 12 months post-AIS.15 Intellectual function is also impaired following childhood AIS with specific areas of weakness seen in attention, complex cognitive skills, executive function, working memory and processing speed.16–18 The effect of age of stroke onset is still uncertain, however it is clear that AIS in childhood and adolescence can have a devastating effect on the child and their future prospects and potentially on the family unit. Despite the potential poor outcome in these patients there is limited literature to support a particular management pathway. The early diagnosis of stroke in children, in particular young children, can be challenging. Paediatric stroke is not readily diagnosed, depending on the age group, and there can be difficulty in differentiating the symptoms from stroke mimics such as acute demyelination or seizures. Similarly, seizures can occur in up to 25% of stroke cases at ictus (a 10-fold higher rate than in adults) which can further confound the diagnosis, accelerate ischaemic injury to the brain and require the urgent administration of anticonvulsants.19 20 The low probability of AIS makes diagnosis difficult especially for non-specialist units and several studies have shown that the median time of symptom onset to diagnosis ranges from 16 to over 24 hours, with a delay in imaging between 8.8 and 16 hours.21 22 Recently, Mackay et al 23 published a study that sought to identify clinical features that would assist in differentiating between stroke and stroke mimics such as migraine and Bell’s palsy. In this study, face, arm weakness and an inability to walk as well as being well in the preceding week were all associated with increased odds of stroke. Imaging modality in the paediatric population can also be problematic. The need to limit radiation exposure is important, however this needs to be weighed against the potential for a missed diagnosis with potential life-altering consequences. Additionally, although CT is readily available it may not be the optimal modality to image childhood AIS. A recent study from The Royal Children’s Hospital (Melbourne, Australia), which serves as a tertiary referral unit, reported that AIS was not visualised on CT imaging in 83.7% of patients (62/74) whereas MRI correctly identified AIS in 100% of patients (8/8).22 Despite this discrepancy, access to MRI is often restricted and in younger children may require sedation or even general anaesthesia. An alternative would be to consider a CT+CT angiogram to demonstrate large vessel occlusion and mitigate the radiation exposure involved with CT perfusion, which itself may be problematic due to the longer acquisition time. Recently, a multicentre consortium developed guidelines on optimal imaging in cases of suspected stroke for children24 and in the hyperacute time window (<6 hours) if MRI is possible they recommend a ‘rapid brain’ imaging protocol that consists of DWI, fluid-attenuated inversion recovery (FLAIR), susceptibility weighted imaging/gradient echo sequences and 3D TOF-MRA. In adult stroke centres comprehensive acute stroke protocols (ASP) increase access to stroke treatment, decreasing costs and improving outcomes.25–27 Shack et al 28 recently reported the findings after the institution of an ASP in 2005. This included a 4-point stroke-screening tool (focal neurological deficit, sudden onset, age ≥6 and symptom onset ≤5 hours). The stroke fellow was immediately contacted for all children who met all four criteria. The history was reviewed and the decision made on whether to activate ‘Code Stroke’ which involved alerting neurology, neuroradiology (diagnostic and interventional), anaesthesia and critical care teams. MRI was performed as the first imaging modality. This study demonstrated a greater proportion of children receiving antithrombotic medication within 24 hours after institution of the ASP. Furthermore, with the use of MRI as the first imaging modality there was a decrease in follow-up imaging and markedly improved diagnostic accuracy, 100% for MRI versus 47% for CT used prior to the ASP. Even though MRI was used as the first modality for imaging the time to diagnosis tended to be shorter (p=0.051), and taken together these facts suggest MRI should be considered the primary imaging modality. In our institution, we perform emergent MRI that includes T1, T2, diffusion-weighted and FLAIR sequences in order to determine the presence of acute haemorrhage as well as the extent of any established infarction and overall volume of at-risk territory. For anterior circulation strokes we will generally consider performing mechanical thrombectomy if the ASPECTS score is ≥4 and there is growing evidence that larger strokes should be considered for treatment in adults.29 Similarly, in the posterior circulation we will consider mechanical thrombectomy so long as there is not a significantly large established infarction within the pons that may result in a locked-in syndrome. Aside from the problems with diagnosis, access to imaging and the appropriate interpretation of the radiological appearances, another problem exists in that there is no consensus on the optimal management for children with AIS. Currently, the window of opportunity for intravenous tPA in children with AIS is unknown. With the absence of dedicated trial data information has been extrapolated from the adult population. It was hoped that the Thrombolysis in Paediatric Stroke study would provide guidance on this issue, however this was abandoned after difficulty identifying and enrolling patients within 4.5 hours of symptom onset, the average therapeutic window for tPA in adults.30 It is also worthwhile noting that the thrombolytic system in childhood is not yet fully mature and the differences in physiology between children and adults may actually result in larger doses of intravenous tPA in children.31–36 Therefore, although thrombolysis in children is performed to consider them as ‘small adults’ and use weight adjusted doses based on this may not be appropriate. Mechanical thrombectomy has recently been shown to be very effective in the adult population with the recent meta-analysis of the HERMES investigators confirming the benefits of mechanical thrombectomy seen in the individual trials.37 However, there are still many unanswered questions and none of these trials enrolled children. Despite this there are several reports of successful mechanical thrombectomy using a variety of different techniques. Recently, Weiner et al 38 reported the successful use of aspiration with the Penumbra system (Penumbra, Alameda, California, USA) in a 15 year-old with a right terminal carotid occlusion. Using a triaxial system and the Penumbra ACE 64 catheter, a large bore distal aspiration catheter, they were unable to successfully achieve a revascularisation of TICI 2 c flow with a paediatric NIHSS of 1 (initially paediatric NIHSS 9) in the paediatric intensive care unit 5 hours after the procedure. Similarly, others have used stent retrievers to achieve good radiological results. Hu et al 39 used a combination of a Solitaire FR (Medtronic) stent retriever and aspiration with the Penumbra system in two patients both of whom achieved a revascularisation of TICI 2a. Neither of the patients suffered any operative or postoperative complications and at delayed follow-up one patient had an NIHSS of 2 and the other 3. Bodey et al 40 reported four cases of children aged between 5 and 15. Three of the children had occlusion of the basilar artery with occlusion of the left MCA in the fourth child. A variety of different stent retrievers were used in these cases including a Solitaire 6×30 mm and a Revive (Cordis, Hialeah, Florida). Half of the children had an mRS of 0 with none of the children having an mRS above 3. These cases show that conventional techniques and equipment developed for adults can readily be adapted and used in children, including children as young as 5. Other cases have also been reported in the literature (table 3) virtually all of which show recanalisation of TICI≥2b which is similar to our own experience in which TICI≥2b was achieved in all the cases. These cases, alongside our own, suggest that mechanical thrombectomy in children is possible and can result in high rates of successful recanalisation. In older children, little or no change in the operative technique is required and the procedure should be relatively straightforward and quick given the lack of tortuosity in this patient population. In younger children, slight changes to the technique, such as using smaller guide catheters, may be required, however, this should not pose significant difficulties to experienced interventional neuroradiologists. Similarly, there may be concern that the available devices are not suitable to the paediatric intracranial arterial architecture because of size issues. However, it has been shown that the cranial growth is rapid during the early years of life and then slows markedly with virtual complete growth by the age of 6 years and 85% of growth is complete by the age of 5.41 Similarly, by the age of 4 years the intracranial arteries have reached 81%–99% of their adult diameters with 87% of the MCA diameter reached by 6 months of age.42 Similar findings were reported by He et al 43 who dubbed it ‘the rule of 5’ since the vast majority of the arterial growth occurs before the age of 5. Therefore, from a practical point of view the procedure in children aged 4–5 and above should not pose a significant challenge for experienced interventional neuroradiologists. The existing aspiration catheters and smaller 3 mm stent retrievers such as pREset Lt (phenox), MindFrame (Medtronic, Irvine, California, USA) or Catch and Catch Mini (Balt, Montmorency, France) would all be potentially appropriate devices. Although the existing data on mechanical thrombectomy performed in the adult population suggest the procedure is safe, it is yet to be proven in the paediatric cohort. Given the difficulties in recruiting patients to such a trial we would recommend the establishment of national and international registries that would allow the capture of data from all individual series. Registries such as the Swedish EVAS registry (www.evas-registry.com) are already well established and could easily accommodate paediatric cases. Mechanical thrombectomy has been shown to be an effective treatment strategy in adults. The currently available devices appear effective in allowing recanalisation in the paediatric age group and this treatment should be considered in this population, especially in older children where little or no change in the operative technique is required.
. Recommendations for improving the quality of care through stroke centers and systems: an examination of stroke center identification options: multidisciplinary consensus recommendations from the Advisory Working Group on Stroke Center Identification Options of the American Stroke Association. Stroke 2002;33:e1–7.
. Recommendations for the establishment of primary stroke centers. Brain Attack Coalition. JAMA 2000;283:3102–9.
. Age dependence of blood fibrinolytic components and the effects of low-dose oral contraceptives on coagulation and fibrinolysis in teenagers. Thromb Haemost 1988;60:361–4.
. Liver volume as a determinant of drug clearance in children and adolescents. Drug Metab Dispos 1995;23:1110–6.
. Mechanical thrombectomy using solitaire in a 6-year-old child. J Vasc Interv Neurol 2015;8:13–16.
. New mechanical recanalization devices - the future in pediatric stroke treatment? J Invasive Cardiol 2010;22:63–6. Contributors PB: data collection, analysis, overall study design. VH and MA: data collection and analysis. HB and OG: review and editing. HH: guarantor. MAP: data collection, study design, review and editing. Competing interests MAP and PB serve as proctors and consultants for phenox. PB serves as a consultant for Neurvana Medical. HH is a co-founder and shareholder of phenox. Data sharing statement The data, which are the basis of this manuscript, were collected in retrospect as a means of quality assurance. There was no scientific intention related to the treatment of the concerning patients ex ante. Neither the collection of data for the purpose of quality management nor the anonymous publication without identifying information requires, according to German law, the consent of the patient or the consultation of the concerning ethics committee (§15 Abs 1 der Berufsordnung der LÄK Baden-Württemberg).